After giving up a career in investment banking, Adrian's love for exercise led him to share his passion for health both on stage with Group-Ex Classes and off stage with Personal-Training. He grew up in Toronto, Canada where he started his athletic career as a competitive swimmer at the age of 13. But with his ever-changing appetite for bigger challenges, he later transitioned to become a triathlete, where he compete on the Canadian National circuit and placed on winners’ podiums beside future Olympians. Graduating with a Bachelor of Science degree in Kinesiology instilled a lifelong commitment to active lifestyles in him. To date, he still competes in triathlons to inspire others onto a healthier way of life. 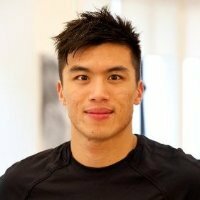 Owning his own personal training business in Hong Kong, Adrian now specializes in giving intense workouts to high-powered investment bankers and lawyers.